Published on May 11, 2016 in Bands/Artists, Eastern Iowa, Little Village Magazine, Music, Out and About and Upcoming Show. 0 Comments Tags: Bo Ramsey, csps, Drifters, legion arts, little village magazine, Live, Paradise Outlaw, Pieta Brown, Red House Records. Some of the most special shows I’ve seen at CSPS have been the ones with Pieta Brown. Though Cedar Rapids isn’t her home turf, I feel like in some ways CSPS has become a 2nd home for her– she seems really comfortable with the crowd which is a mixture of Cedar Rapids and Iowa Citians and is capable of giving a very intimate show in the big space. We’re getting a treat with Bo Ramsey opening for Pieta as he doesn’t do many solo shows. His last show was opening for Pieta at the Englert. I can’t remember the last time Bo played solo in Cedar Rapids! The show is at 8PM, Saturday night and the tickets are $17 in advance and $21 at the door. Bring some extra cash or plastic to pick up the Drifters CD and to try out the regional beers and wine at The Carlo Bar. Ticket and show information are at the Legion Arts website. Published on November 22, 2015 in Bands/Artists, Eastern Iowa, Little Village Magazine, Media, Music, Out and About and Upcoming Show. 0 Comments Tags: Above the Prairie, Cedar Rapids, csps, legion arts, new album, Red House Records, Thanksgiving, The Pines. To add to the things we’re thankful for this year, The Pines are making a return to CSPS Thanksgiving Weekend! 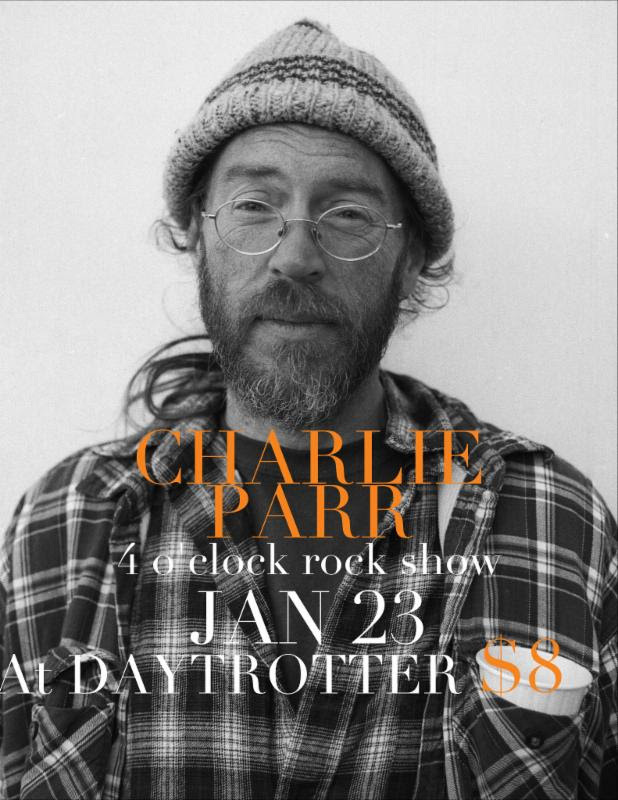 The combination of the soft atmospheric folk of this band and the passionate, attentive crowds and the huge ambience of the room (and frankly, well stocked selection of handcrafted beers and local wines) always makes for a memorable not-to-miss show. This show is on the heels of the announcement of their new album Above the Prairie, due out February 5th on Red House Records. This is their first new album since the brilliant Dark So Gold in 2012. 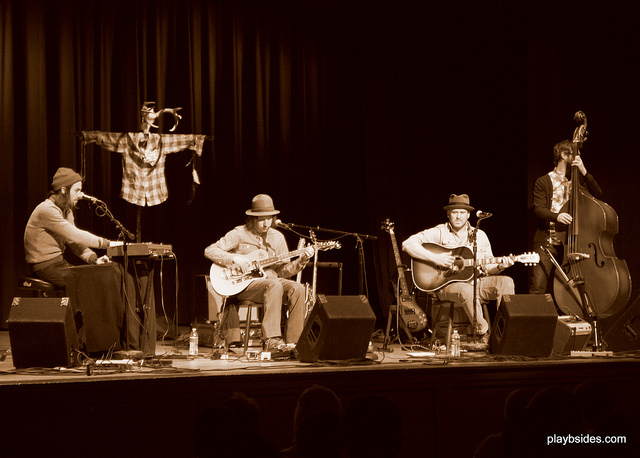 In the interim, the band released a digital single of “The Highwayman” in 2013, and earlier this year they released an EP of covers titled Pasture: Folk Songs. Above The Prairie includes help from the extended Ramsey and Brown families with contributions from Greg Brown, Iris DeMent, Pieta Brown and Bo Ramsey, who also co-produced the album with The Pines. The first listen we’re getting from the new album is “Aerial Ocean” with Benson Ramsey on lead vocals, it has all of the trademark nuances of The Pines– the chimey clean picking, the washes of synths, but owes a lot to classic Dire Straits. But, they always kind of had that same vibe as mellow Mark Knopfler as well as JJ Cale. So, grab a quick sandwich of leftover turkey and dressing on your way out the door to CSPS Saturday night to see The Pines. I can’t think of a better way to cap off the weekend. Published on July 14, 2012 in Bands/Artists, Eastern Iowa, Little Village Magazine, Music and Vinyl. 0 Comments Tags: Dark So Gold, Pieta Brown, Red House Records, The Pines, Vinyl. Red House Records officially announced this week that they have pressed The Pines’ latest album Dark So Gold on vinyl, available Tuesday, July 17th. This is the second vinyl release from Red House Records since they decided to get back into the vinyl game with Pieta Brown’s One and All release. That release was a beautiful 180g pressing with a variation on the CD cover art. I was concerned that they weren’t going to continue doing vinyl when Brown’s Mercury album didn’t get the same treatment. Though there has never been an official statement about it, I suspect that the One and All vinyl didn’t sell as many as they’d planned. When I talked to the mailorder folks at Red House, I expressed how happy I was that this album was getting a vinyl release, they commented that they felt this was a good one to release on vinyl. I also learned that the cover art matches the CD, and the center label has a black and white photo of the band. Dark So Gold is easily one of my favorite releases for 2012, and my favorite Pines release to date. I wrote a review for Little Village Magazine in February. 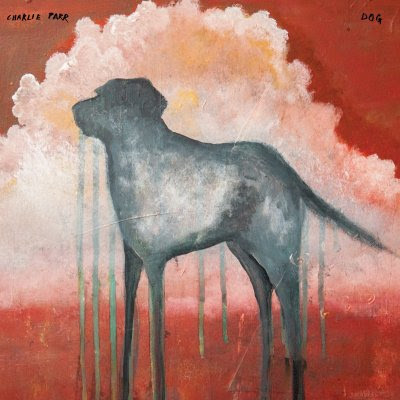 For The Pines latest release, Dark So Gold, they’ve broken out the box of the same paints and brushes as before and laid to canvas landscapes made of soft-focused, almost half-remembered dreams. To the observer, only the smallest details of the picture are revealed—a conversation perhaps, a late-night glance to the sky, a heartfelt emotion lingering. As we reach for meaning we fill in little bits of ourselves. CLICK HERE to order your copy of Dark So Gold from Red House Records for $15 plus shipping and includes a digital download card. The record will be available at Pines shows as well. 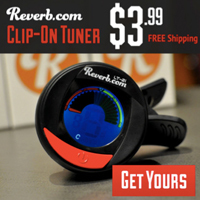 Published on April 8, 2012 in Bands/Artists, Eastern Iowa, Music, Out and About and Upcoming Show. 0 Comments Tags: Benefit, Benson Ramsey, Bo Ramsey, Constie Brown, David Huckfelt, Friends of Hickory Hill, Greg Brown, Iowa City, Iowa Public Radio, JT Bates, Michael Rossito, Pieta Brown, Red House Records, Sandy Dyas, The Mill Restaurant, The Pines, This Land Is Your Music, Upcoming Show, Zoe Brown. 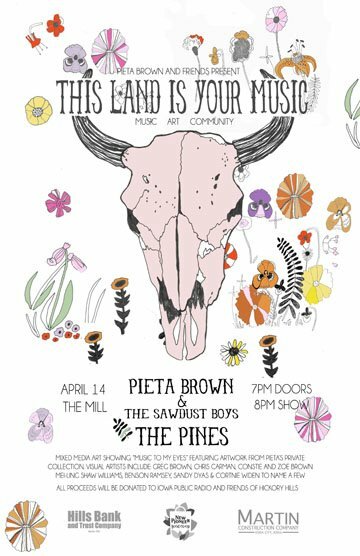 Ms. Pieta Brown is bringing her “artist in residence” show called “This Land Is Your Music” back to The Mill Restaurant in Iowa City on April 14th, 2012. In a similar fashion to the last two the show will feature Pieta as the headliner with other artists with local ties opening and a gallery exhibit. This year, the event has been condensed into one show– but it is a powerhouse bill shared with The Pines and is a weekend show. 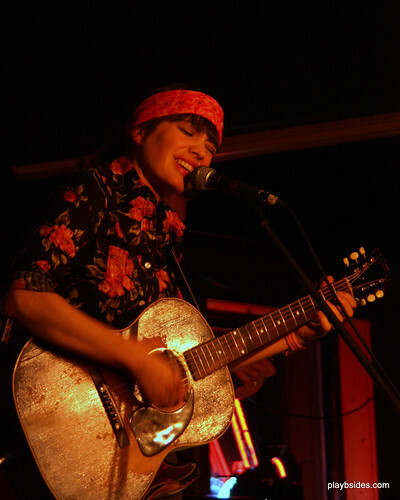 Pieta’s set will be with a backing band that she is calling The Sawdust Boys– which is what she called her backing band for her recent tour of Australia. The Sawdust Boys are JT Bates and Michael Rossetto, who are conveniently also part of The Pines. I’m sure we’ll see Bo Ramsey as part of one or both band’s sets. Bo stopped by somewhat unannounced for the recent Pines show at CSPS and brought the house down with an unexpected solo song! 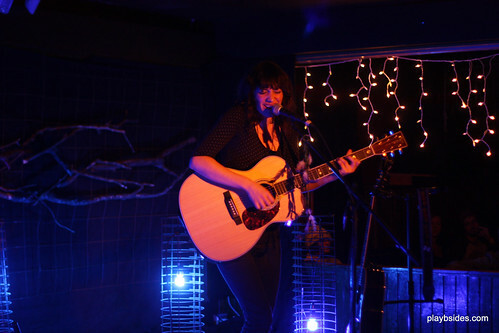 In the past Pieta has used these shows as a way to work out new material in a live setting– The Mill is a long-standing familial venue for the Ramsey’s and Brown’s and their associated friends. The audience for Pieta’s shows are by far some of the warmest and welcoming I’ve seen and impromptu sit-ins by friends and family are par for the course. The gallery exhibit will feature pieces from Pieta’s private collection, including works from Greg Brown, Chris Carman, Constie and Zoe Brown, Mei-Ling Shaw Williams, Benson Ramsey, Sandy Dyas, and Cortnie Widen. As with the previous This Land Is Your Music shows, this show is a benefit for Iowa Public Radio, and The Friends of Hickory Hill Park. Show is at 8PM on Saturday, April 14th with doors at 7PM. Tickets are $12. Visit the Mill Restaurant webpage for details and how to order tickets. 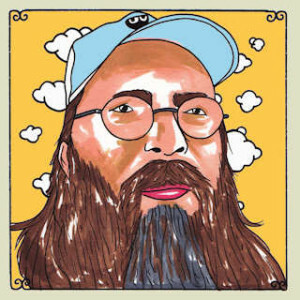 Published on February 2, 2012 in Bands/Artists, Daytrotter, Eastern Iowa, Music, Out and About and Upcoming Show. 0 Comments Tags: Andre Durand, Bon Iver, Cry Cry Crow, csps, Daytrotter, legion arts, Red House Records, The Pines, Upcoming Show, video, youtube. Red House Records recording artists and former Iowa City band The Pines are returning to the big stage at CSPS in Cedar Rapids on Saturday, February 4th. The Pines were here just last September as the third act to play the newly re-opened CSPS which had gone under a very extensive remodeling and updating over the previous year. The picture above is from that show. This time the band is back as part of a tour supporting the release of the band’s fourth album Dark So Gold which came out this week and has already drawn some critical praise for its uniquely moody atmospheric approach to folk blues. A first for the band– a video has been produced for the song “Cry Cry Crow” from Dark So Gold. Written and directed by Andre Durand who also did the “Calgary” video for Bon Iver, it captures the mysterious vibe of the song well. I hope the band will continue making videos! 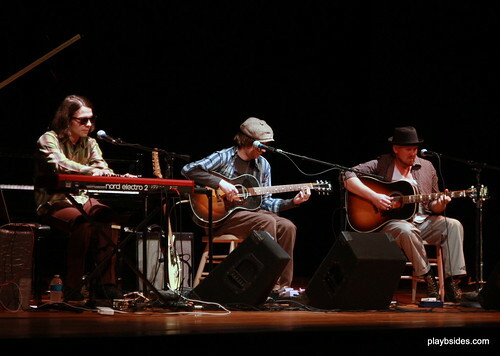 The Pines will be hitting the Legion Arts CSPS Hall stage at 8PM. Tickets are $11 in advance and $15 at the door. Click Here to visit the Legion Arts website for more details. By the way, you should consider visiting Daytrotter to check out their Pines session. Published on January 1, 2012 in Bands/Artists, Downloads, Eastern Iowa, Little Village Magazine, Media, Music, Out and About, Personal History, Upcoming Show and Vinyl. 0 Comments Tags: 10" record, 2012, Benson Ramsey, Bo Ramsey, Bon Iver, Camper Van Beethoven the Mill, Cheyenne Marie Mize, Chicago, David Huckfelt, Delmark, Garbage, Gary Lightbody, Gayngs, Hiss Golden Messenger, Iowa City, jacknife lee, Jacob Jones, James Elkington, Janet Beveridge Bean, Jeff Parker, M.C. Taylor, minneapolis, nashville, new releases, Polica, R.E.M., Red House Records, Snow Patrol, the 5 spot, the diplomats of solid sound, The Horse's Ha, The Pines, The Right Now, Tired Pony, Tortoise, Totally Gross National Product, Vinyl, YepRoc. 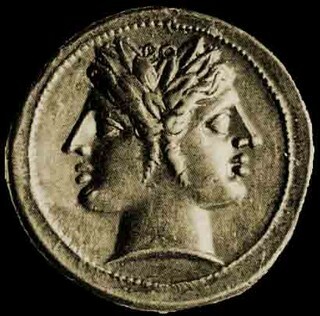 The month of January was named after the Roman goddess Janus who had two faces. Like the goddess, January is the month of the year when we both look back on the previous year that is over as well as ahead to the year coming up. I just posted my favorite releases for 2011— here is a list of releases that I’m looking forward to in 2012. The Right Now – sophomore release (April 21st) – The Chicago R&B group The Right Now has had a pretty great run since their first album Carry Me Home came out in 2010 (which I was the Executive Producer on). They’ve played some pretty great headlining shows as well as opening for many of the bigger R&B acts touring. They flew out to L.A. in 2011 to work with Sergio Rios of Orgone at his studio for their 2nd album. Most of songs for this album have had their fair share of live workout and it shows– as someone who has seen the band a lot over the last year, the new songs have already become standards. The album will be released on Record Store Day. Jeff Parker – Bright Light In Winter (February 2012) – The guitar-slinger for post rock fountainhead Tortoise is releasing his third solo album on Chicago Blues/Jazz label Delmark. Jeff Parker’s first solo record Like Coping was released on Delmark, with his second solo record The Relatives on Thrill Jockey. Credited as the Jeff Parker Trio, the album will feature Chris Lopes on bass and Chad Taylor on drums. BTW: Don’t get me wrong– I’m a Thrill Jockey fanboy of the first order, but when was the last Jazz release from Thrill Jockey? (It was Chicago Underground Duo…) Thank goodness for Delmark, or we wouldn’t get these crucial releases from Chicago’s Jazz scene! Garbage – title TBD (March or April 2012) – I reported on this previously. The new fifth album from Garbage is apparently in the can and mastered. There have been reports of an extensive tour in 2012 as well. Snow Patrol – Fallen Empires (January 10) – After developing a big crush on the Tired Pony record, I was waiting expectantly for this album as it was produced by Jacknife Lee who also produced R.E.M.’s album Collapse Into Now, and with all of the ties to R.E.M.– Pete Buck was in Tired Pony, Michael Stipe helped Gary Lightbody get through some writer’s block– I was hoping for something great. The first song from Fallen Empires was “Called Out in the Dark” which has an unstoppable beat and build to it. I think that the promise of Tired Pony delivers on Fallen Empires. Poliça – Give You The Ghost (February 14) – Technically, this album is already out as it is available as digital download from iTunes and Amazon. But, the debut album from GAYNGS lead vocalist Channy Leaneagh’s (formerly Channy Moon Casselle) new band Poliça will be officially released on CD and vinyl on producer Ryan Olson’s record label Totally Gross National Product on Valentine’s Day 2012, complete with sold-out shows at First Avenue. If you are a fan of the vocoder-laiden production of GAYNGS and Bon Iver (Mike Noyce from Bon Iver helps out on vocals on a couple of tracks, too), then you’ll love this album as much as I do! The lineup of two drummers, bass, vocals and keyboards gives the band a very unique sound, but also pretty reminiscent of 90’s trip hop from bands like Morcheeba, Sneaker Pimps and Portishead. 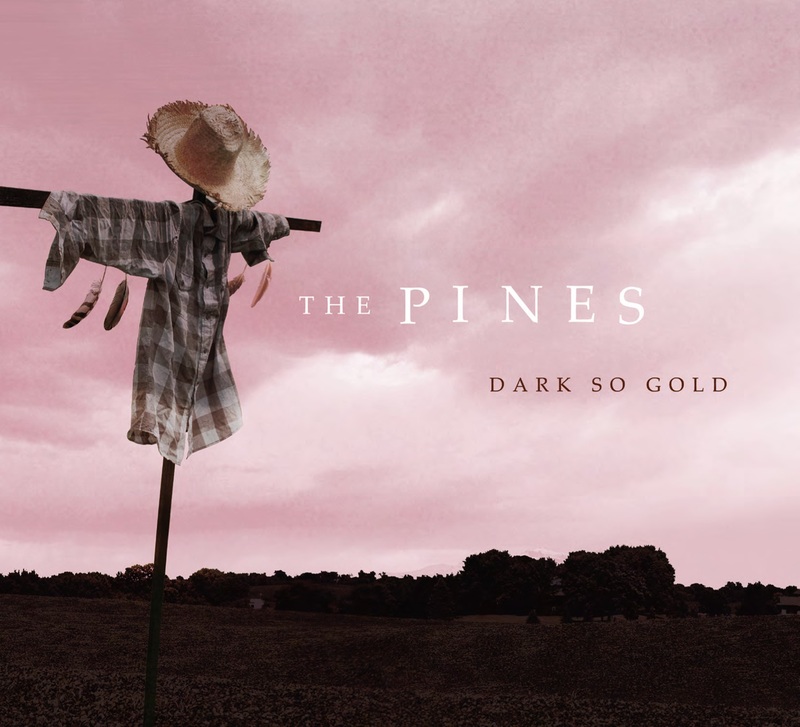 The Pines – Dark So Gold – (January 31) – The third album from The Pines on Red House Records find principal members Benson Ramsey and David Huckfelt living in two different cities. This doesn’t prevent them from turning out their best collaboration, yet. I caught three of their shows back in May and their stop at CSPS in September and got to hear songs destined for Dark So Gold, so I was already looking forward to hearing the studio versions of “Cry Cry Crow” and “If By Morning.” Produced again by Benson’s dad, Bo Ramsey. The Pines are kicking off a tour at the beginning of February in support of the new album and will be making stops at CSPS again as well as The Cedar Cultural Center in Minneapolis. 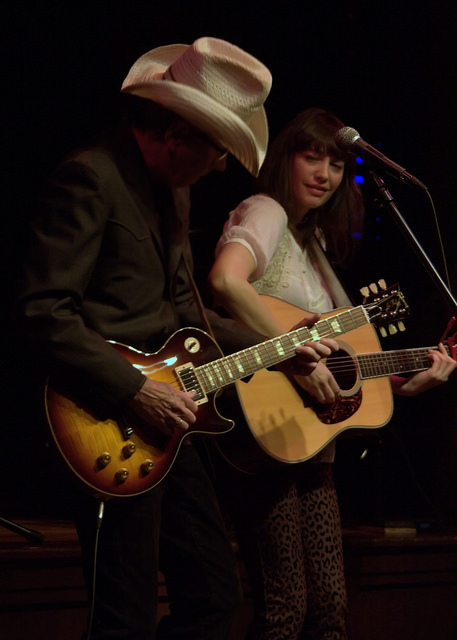 Cheyenne Marie Mize – We Don’t Need EP – (January 24) – What started out as a release on My Old Kentucky Blog’s label Roaring Colonel has been picked up by Cheyenne Marie Mize’s new label home YepRoc. I loved her last album Before Lately and managed to catch her at The Mill where she performed the percussion-plus-vocals “Wishing Well” which Consequence of Sound is debuting. You can also check out her Daytrotter session to listen to “Keep It” which is also on the 6-track EP available on 10″ vinyl and digital download. Jacob Jones – Good Timin’ in Waynestown – (August?) – Jacob Jones is someone my wife and I met in Nashville during an overnight stop on a Monday night with Brendan of The Right Now. We were on a marathon road trip getting the mastering done and dropped off for the vinyl version of Carry Me Home. Brendan insisted we needed to hit this local-yokel bar called the 5 Spot where they have this over-the-top dance party on Monday nights. This dance party called “Keep on Movin'” is hosted by Jacob Jones and his label partner Reno Bo and consists of mostly 50’s and 60’s country, R&B, garage rock and blues– typically spun on a turntable (though sometimes from a MacBook). The drinks are cheap, the folks are friendly and the floor is packed. Suffice it to say, it was one of the most memorable events we’ve been to, and certainly one of the high-points of the trip. In addition to purveying this party, Jacob is also a singer/songwriter with a couple of pretty great Americana records under his belt. I introduced blogger Amber Valentine to his music and she wrote this really great review of his last release, which is a free download. When I was pinging folks for releases I reached out to Jacob and he told me about his 2012 release, Good Timin’ in Waynestown which is inspired by the 5 Spot Monday nights! “Good Timin’ In Waynetown” is about the good times. plain and simple,” Jacob told me in a recent conversation, “The songs are for dancing. drop the needle and get to work. 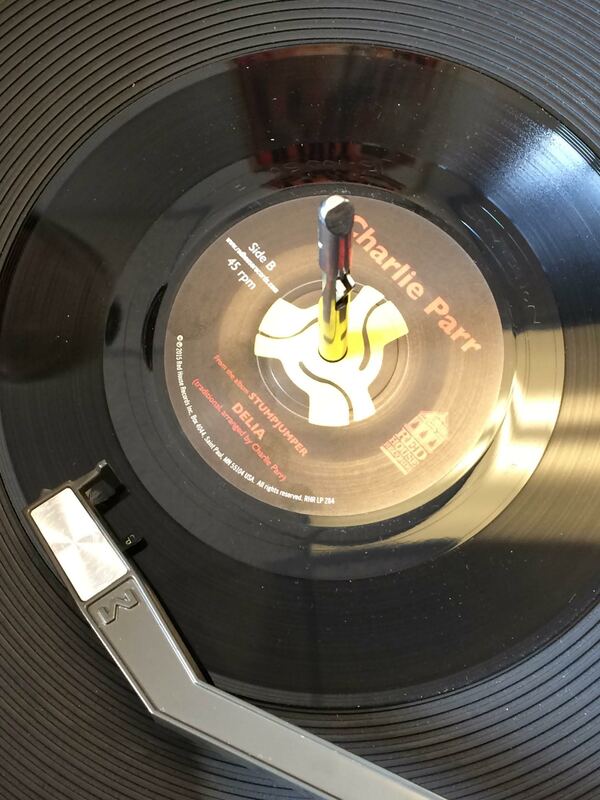 The songs are filled with huge sounds of New Orleans and Nashville, Memphis and Mussel Sholes. They are about the finer things in this world like love and having good friends, that’s it, plain and simple.” Indeed, based on the couple of rough mixes he sent, this album has a big sound somewhere between Ray Charles, Chris Isaak, and Lyle Lovett. This release is going to come out on vinyl, too, so that is really exciting! A sure bet for my best of 2012. The Diplomats of Solid Sound – TBD – I don’t have any details about the third release of Iowa City-Chicago-Austin band The Diplomats of Solid Sound with the Diplomettes other than it was recorded in Iowa City in 2011 and that they played some of the new songs at their gigs leading up to and on New Year’s Eve. I loved their last two albums, so there should be no reason to believe I won’t love this one, too! Camper Van Beethoven – TBD – News of this release– their follow-up to 2004’s New Roman Times— was delivered with a run of tour dates starting this week. No other details other than this run of winter dates will include some of the songs from the forthcoming record. Hiss Golden Messenger – TBD – As if releasing the amazing 1-2 punch of Bad Debt and Poor Moon over the last two years wasn’t enough, M.C. Taylor is planning to come back in 2012 with another album! As part of one of the Poor Moon pre-order bundle he included a bonus digital EP called Lord I Love The Rain that included outtakes and demos, but also had early versions of tracks that will be on the next album. Though we’ll see if this is the next album or maybe another project he hinted at in a recent conversation! The Horses Ha -TBD – In a recent conversation with Janet Beveridge Bean she told me that James Elkington and she were done recording the follow-up to the debut Horses Ha release The Cathmawr Yards which came out in 2009. I absolutely loved the jazzy folk harmonies from The Horses Ha. You can read my review of The Cathmawr Yards here. Watch my site for updates as I get them! Published on August 9, 2011 in Bands/Artists, Downloads, Eastern Iowa, Music, Upcoming Show and Vinyl. 0 Comments Tags: album, Bo Ramsey, iTunes, LP, Mercury, Pieta Brown, Red House Records, single, Vinyl. 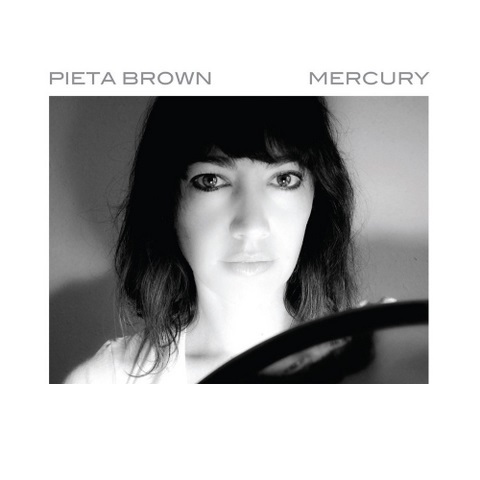 Red House Records and Pieta Brown announced today that her new album titled Mercury— her second for the label will release on September 27th with an iTunes download of the title track available immediately. There is also a pre-order on iTunes with two-minute samples of every track on the 13-song album. 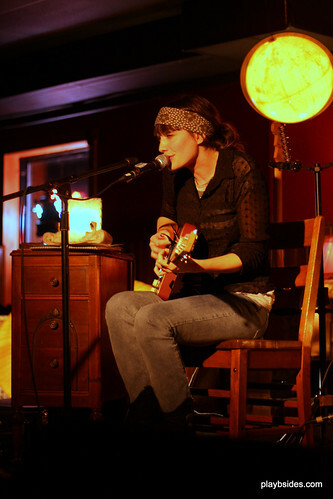 At first blush the album continues the honey-drenched laid back bluesy folk sound that is her trademark sound. Pieta’s first album on Red House Records, One and All, marked the re-entry of the label back into vinyl records, and although the e-mail sent out today doesn’t specifically mention Mercury vinyl, I know the label is supporting more releases in the future, so it stands to reason that this album will be too. I’ll post more information as I get it! The Time to play b-sides archives for the red-house-records tag.